I recently learned that you can buy champagne in cans thanks to the genius of Francis Ford Coppola vineyards. If you winced at that sentence, canned champagne is definitely not for you. For the rest of us, it’s delightful sparkling wine. 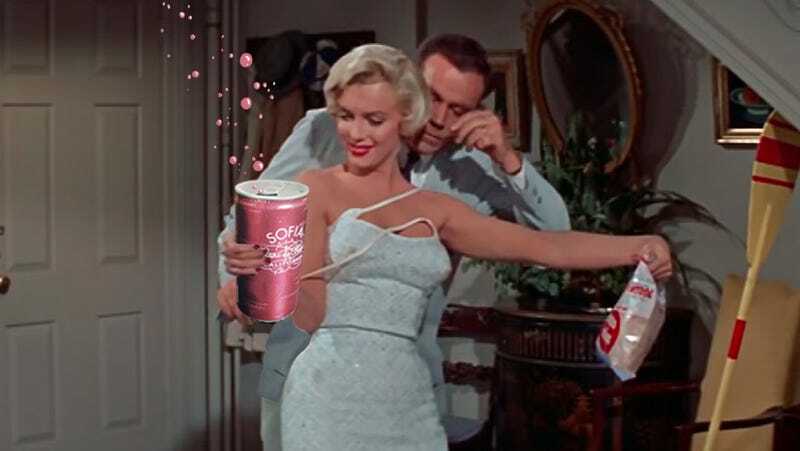 Resplendent in its skinny pink can, Sofia Mini is not a new product, but the bar around the corner from my Brooklyn apartment just started selling it, and I’ve been noticing it lately in quite a few area watering holes. It’s not good! The first time I tried Sofia Mini, it neither exceeded nor fell short of my expectations. I found it to be too sweet, too fizzy, and exactly what you’d expect from canned champagne. It’s also technically not champagne, since it’s not from the Champagne region of France, and possibly couldn’t even point out France on a map. But I don’t envision a future where France will ever be mass-producing a precious native export in aluminum vessels you can buy at dive bars and Costco. Look, this isn’t exactly highbrow. Canned sparkling wine is bad, and it’s supposed to be. Whether you are heading to the beach or needing party favors, these cute mini-Sofa cans are the PERFECT option!! PERFECT single serves on the go (just don’t use the sippy straws). These are perfect to put in your luggage when you fly. I have never had a problem and it’s nice to have just one glass when traveling and not waste a bottle. How else can you drink champagne on the beach? perfect for non-wine-snobs on picnics, camping, mardi gras, etc. definitely will buy again for such occasions. Sofia Mini will never be served at a gala, but who wants to go to a gala anyway? Where you really want to go is a backyard barbecue or a dive bar where they have cans of champagne on ice for the hell of it. You want to drink this stuff on a train or a bus en route to a party. It’s grimy, and it’s convenient, and it’s celebratory, unlike highfalutin bottled champagne. That, my friend, is perfect. Bad and perfect.